Artesi was founded in 1948 by Antonio Artesi and based in Palermo. The charm of the car and "fever manufacturer" from time to time strikes someone. We have already seen in this volume to the relatively recent past, both remote of Italian. One of these "fever" in 1948 struck so virulent even Antonio Artesi in Palermo. 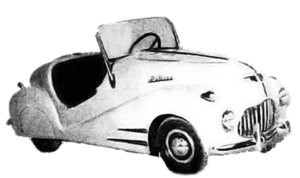 Artesi built a small car from the city that very affectionately called the Pulcino (Chick) equipped with an engine derived from two-stroke, 125 cc, air cooled, chain drive, 4-speed gearbox + reverse motorcycles motor. The vehicle only weighed 150 kg. The car looked very nice and collected great attention with the crowd of visitors at the III/A Fair of the Mediterranean which was held in Palermo. In fact, the body had rounded corners as was in style with the then American cars of the era and was echoed in the front hood and grille. The unmistakable shape of the prestigious Pontiac. Mr. Artesi satisfaction was to collect all the benevolent and affectionate appreciation of the public, but not those of the buyers since it remained a prototype and never made it into production.